Some people argue that morality is the result of blind evolutionary forces rather than an omnipotent Creator. This view is flawed because (1) it assumes a morality that transcends evolutionary “morality,” (2) it cannot explain motive and intent, (3) it denies rather than explains morality, and (4) it cannot account for the “oughtness” of morality. Given the existence of morality as well as the nature of moral claims, the existence of God seems to be the best explanation for morality. Bongo is a chimp. He’s being punished by other members of the chimpanzee band for not sharing his bananas. Bongo is selfish. Bad Bongo. Moral rule: Chimps shouldn’t be selfish. One of the strongest evidences for the existence of God is man’s unique moral nature. C. S. Lewis argues in Mere Christianity that there is a persistent moral law that represents the ethical foundation of all human cultures. This, he says, is evidence for the God who is the author of the moral law. Not everyone agrees. 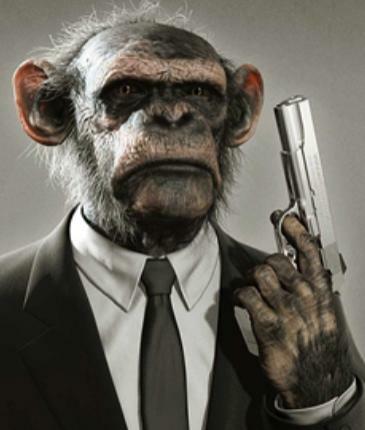 Scenarios like that of Bongo the chimp have been offered as evidence for rudimentary forms of morality among animals, especially the “higher” primates like chimpanzees. This suggests that morality in humans is not unique and can be explained by the natural process of evolution without appeal to a divine Lawgiver. This view of morality is one of the conclusions of the new science of evolutionary psychology. Its adherents advance a simple premise: The mind, just like every part of the physical body, is a product of evolution. Everything about human personality — marital relationships, parental love, friendships, dynamics among siblings, social climbing, even office politics — can be explained by the forces of neo-Darwinian evolution. In his popular defense of evolution, The Blind Watchmaker, Richard Dawkins acknowledges that the biological world looks designed, but he asserts that this appearance is deceiving. The appearance of intelligent order is really the result of the workings of natural selection. and romantic love that was not only invented by evolution, but corrupted by it. Some mothers have a genetic predisposition to love their children, so the story goes, and this genetic predisposition to be loving is favored by natural selection. Consequently, there are more women who are “good” mothers. What is the evidence, though, that moral virtues are genetic — a random combination of molecules? Is the fundamental difference between a Mother Theresa and an Adolph Hitler their chromosomal makeup? If so, then how could we ever praise Mother Theresa? How could a man like Hitler be truly guilty? Wright offers no empirical evidence for his thesis. He seems to assume that moral qualities are in the genes because he must; his paradigm will not work otherwise. This statement captures a major flaw in Wright’s analysis. His entire thesis is that chance evolution exhausts what it means to be moral. He sees morality as descriptive, a mere function of the environment selecting patterns of behavior that assist and benefit the growth and survival of the species. Yet he frequently lapses, unconsciously making reference to a morality that seems to transcend nature. It’s almost as if there are two categories of morality, nature’s morality and a transcendent standard used to judge nature’s morality. But where did this transcendent standard come from? It’s precisely this higher moral law that needs explaining. If transcendent morality judges the “morality” that evolution is responsible for, then it can’t itself be accounted for by evolution.